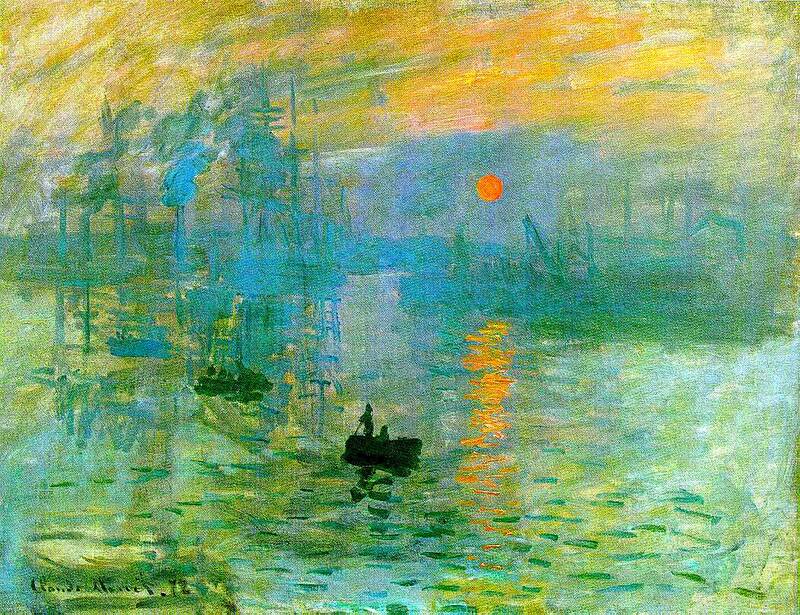 The above painting, by Claude Monet, entitled Impression: soleil levant (Impression: Sunrise) was displayed in the First Impressionist Exhibition held in Paris in 1874. Purportedly, the title of this painting provided the name that came to be used for the entire painting technique of Impressionism! Monet had done the painting in his hometown of Le Havre, from his studio window. When asked to give a title for the exhibition catalogue, he didn't want to call it a view of Le Havre. So he instructed the catalog maker to call it Impression. Accordingly, the painting was officially catalogued as: Impression: soleil levant. Impressionism was a major movement in painting that developed in France during the late 1860's and flourished during the last three decades of the 19th Century. The intellectual father of this movement was the poet and art critic, Charles Baudelaire (1821-1867). Most truly Impressionist paintings were produced after 1870 and before 1886. These paintings were accomplished by a group of artists who shared a set of related approaches and techniques. The most conspicuous characteristic of Impressionism was an attempt to accurately and objectively record visual reality in terms of the transient effects of light and color. In my opinion, there were ten painters who produced the best Impressionist art during this Era. Seven of these painters worked mostly in the Impressionist style during this period: Gustave Caillebotte, Claude Monet, Camille Pissarro, Alfred Sisley, Pierre-Auguste Renoir, Berthe Morisot, and Mary Cassatt. Two other major painters, Edgar Degas and Paul Cézanne, utilized the Impressionist style in the 1870s. 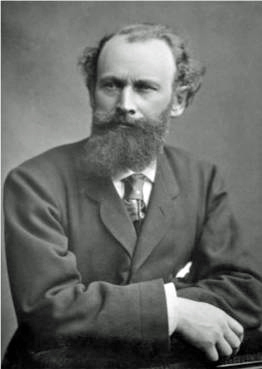 Lastly, the great painter Edouard Manet, whose work in the 1860s greatly influenced most of the others in the group, occasionally made paintings using Impressionist techniques during the last decade of his life (1873-1883). Subjects chosen for painting usually pertained to what the artist actually saw in his/her everyday life. Paintings frequently depicted modern-day urban scenes, particularly of Paris and its environs. When painting landscapes, the artists usually worked outdoors rather than in the studio. Colors were applied with as little pigment mixing as possible. The intended effect was to provide a vibrant experience for the viewer. Paint was applied in short, thick strokes, usually in a sketch-like form. The essence of a subject was to be captured rather than all of its details. Darker shades of a color were made by mixing with complementary colors. Black pigment was used only as a color in its own right. Instead of waiting for successive applications to dry, wet paint was painted onto wet paint in order to produce softer edges and better intermingling of colors. The surface of an Impressionist painting was typically opaque. Thin paint films (glazes) were not used. Impressionist painters emphasized the play of natural light on a object and were concerned with the way in which colors reflect from object to object. In outdoor paintings, shadows on the ground were usually painted showing reflections of the blue of the sky on their surfaces, thus providing a sense of freshness and open space. The main disagreement between idealism and empiricism concerns the extent to which humans are dependent upon sense experience in order to obtain knowledge. Idealists claim that there are significant ways in which our mental concepts and knowledge are gained independently of sense experience. Empiricists claim that sense experience is the only source of all our concepts and knowledge. A major form of empiricism which became dominant in the 20th Century is materialism, particularly as reflected in the political and/or economic systems of Capitalism, Socialism and Communism. Most of the impressionist painters were, at least to some degree, artistic realists and probably leaned toward a materialist philosophy of some sort (probably Socialism); however, most of them did not clearly articulate such beliefs. In 1863, Charles Baudelaire published a critical essay entitled Le Peintre de la vie moderne (The Painter of Modern Life). Over time, this essay became the philosophical credo of the Impressionist movement. While he greatly admired the Romantic painting of Eugene Delacroix, he believed that the time had come to develop some new artistic principals. Subject to a few reservations, Baudelaire accepted the basic philosophical viewpoint of Idealism. However, he believed that the subject matter of the "painter of modern life" should be the modern world with emphasis on the urban life of the great cities such as Paris. The major elements of his belief system are summarized on the Baudelaire page of this web site. Almost all of the major Impressionist artists read Baudelaire's essay. The great painter, Edouard Manet, was particularly influenced by Baudelaire's thinking. At the time that the essay was published, Manet and Baudelaire had been friends for several years. Unfortunately, Baudelaire died in 1867 after a lengthy illness. Even so, after 1863, Manet began to apply Baudelaire's ideas to his own painting. 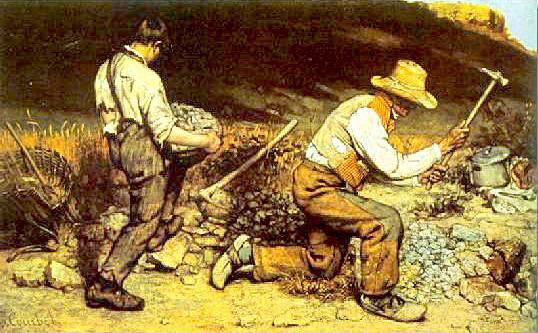 He also passed these same ideas on to many of the other artists that became major Impressionist painters. In particular, Degas, Morisot, Monet and Renoir were heavily influenced by Manet's aesthetic beliefs. *Of the eight impressionist exhibitions, the Third Exhibition was by far the most important. It was organized and financed by Gustave Caillebotte and all of the major impressionist artists, except Manet, submitted important works. Due to the strong urging of Caillebotte, even Cezanne agreed to participate. But Manet, as usual, submitted only to the Paris Salon that year. Unfortunately, his beautiful and magnificent painting, Nana, was rejected. If only he had shown that painting at the Third Impressionist Exhibition! Caillebotte himself submitted 6 paintings, two of which are considered to be among his finest works: Rue de Paris, temps de pluie (Paris Street, Rainy Day) and Le Pont de l'Europe (The Bridge of Europe). **Renoir declined to exhibit at the Seventh Exhibition. However, the art dealer, Durand-Ruel, contributed 25 Renoir paintings from his holdings. ***The eighth and last Impressionist exhibition was an overall financial failure. The Exhibition was dominated by a huge painting of a new artist, Georges Seurat (1859-1891). 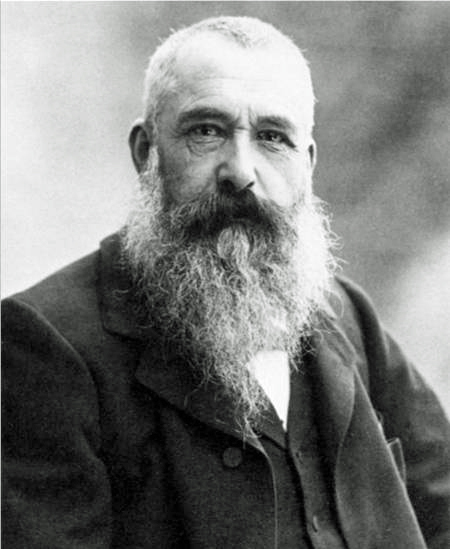 He had been brought into the group by Pissarro, who had himself adopted Seurat's painting techniques. Seurat was the founder of what came to be called Post-Impressionism. His painting titled Un dimanche après-midi à l'Ile de la Grande Jatte ( Sunday Afternoon on the Island of the Grande Jatte ) was the sensation of the exhibition and was subject to highly adverse criticism. However, this painting is now regarded as perhaps the most important Post-Impressionist work. I have arbitrarily defined the Impressionist Era as commencing in 1863 and ending in 1886. 1) In that year, an essay was published that became the virtual Impressionist manifesto. Written by the great French poet Charles Baudelaire, the essay was titled Le Peintre de la vie moderne (The Painter of Modern Life). 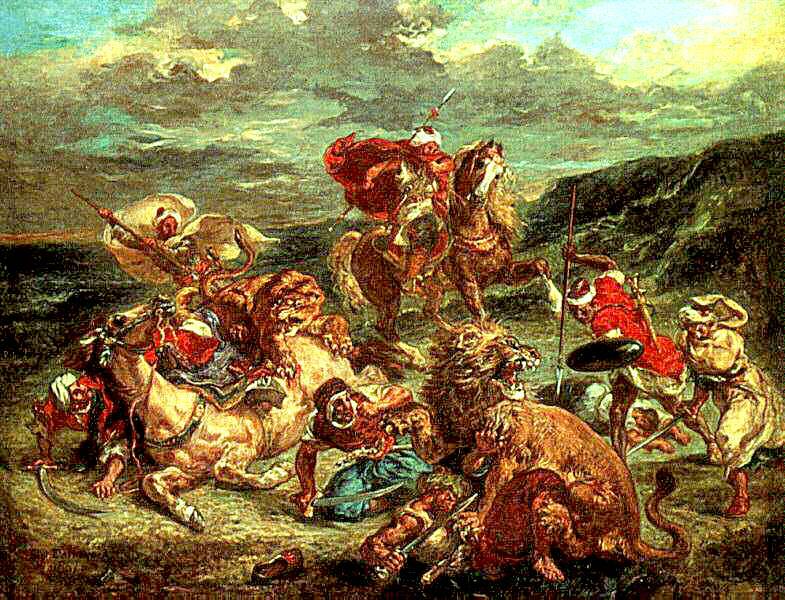 2) The greatest French Romantic painter Eugene Delacroix died in 1863. To many Frenchmen, this was an indicator that the best years of Romanticism were now in the past. 3) Lastly, 1863 was the year of the Salon des Refuses. That year the Jury of the French Academy rejected so many fine paintings submitted to the Paris Salon that there was a great public outcry. To appease this anger, the Emperor Napoleon III commanded the holding of another exhibition, coincident with the traditional Salon, that was composed exclusively of paintings that had been rejected by the Academy. This very unusual action was a further indication that the old traditional standards of French Art, i.e., Neoclassicism, Romanticism and Realism were crumbling. I have arbitrarily defined the year 1886 as marking the end of the Impressionist era. By 1886, Edouard Manet had been dead for three years and the Impressionists were bickering among themselves. In 1886, the Eighth Impressionist Exhibition was held; it was the last. Only half of the major Impressionist artists submitted paintings to the Eighth Exhibition and there were few truly Impressionist works exhibited. Instead, Post-Impressionist artists such as Seurat, Signac and Gauguin drew most of the attention. Accordingly, by 1886, the Impressionist Era had, for all practical purposes, come to an end. As cited at the beginning of this page, I identified ten individuals as being the most important painters of the Impressionist Era. The purpose of this web site is to depict and analyze one painting from each artist. All of these paintings were done in the Impressionist style and were produced during the period from 1872-1882. Many of the scenes depicted are set in Paris and all the scenes illustrate some aspect of modern life (Baudelaire would be happy!). The works selected are considered to be among the best paintings ever produced by each of these artists. My analyses of these paintings are accessible by clicking on the button for the artist's name, located on the upper left side of this page, or by clicking on the appropriate hyperlink from the following table. Four of the paintings were originally part of the Caillebotte Bequest (now exhibited at the Musee d'Orsay in Paris); they are marked with a red asterisk (*). This project is being accomplished mainly as an intellectual exercise for my own personal amazement and amusement. Even so, the results of this study are being made available to anyone who may have similar interests via this web site. Essays appended to this site provide my interpretations of the paintings by the artists cited. These interpretations are my own and I am solely responsible for any errors, whether objective or subjective, that may be found.